This new book by David Shapiro, author of the classic Neurotic Styles, throws light, from a clinical standpoint, on a subject of importance, both theoretically and for therapeutic practice, for psychoanalysts and psychotherapists, as well as for those with general interests in philosophy or psychology. A Psychodynamic View of Action and Responsibility explores the individual’s experience of ownership or responsibility for what he or she does, says and even believes, and their avoidance of that experience. David Shapiro considers the self-deception necessary for these disclaimers of responsibility and the surrender of personal conviction and autonomous judgment. With numerous excerpts from therapeutic sessions, he shows these to be self-protective reactions forestalling or dispelling the anxiety of internal conflict and also, as in false confessions, external threat or intimidation. Shapiro presents this important thesis in his usual lucid way and in many contexts. Its recognition, in his view, is critical for therapeutic work. This book demonstrates the central place in psychological dynamics of the subjective sense of personal responsibility or ownership of what one says or does. The subject is nowhere treated with the depth and emphasis on subjective experience seen in these chapters. A Psychodynamic View of Action and Responsibility will appeal to professionals and students of psychoanalysis and psychodynamic psychotherapy, as well as clinical psychologists, CBT practitioners, philosophers and legal scholars. "Ever since his classic book Neurotic Styles, I have followed each new work by David Shapiro with eagerness, and I have never been disappointed. Few writers in our field come close to his ability to capture the nuances of subjectivity and the painful consequences of our efforts to blur that subjectivity in order to gain short-term comfort. In an age of psychotherapy by acronym, he offers us instead an engagement with each patient’s humanity. "-Paul L. Wachtel, Ph.D., Distinguished Professor of Psychology, City College of New York and CUNY Graduate Center. 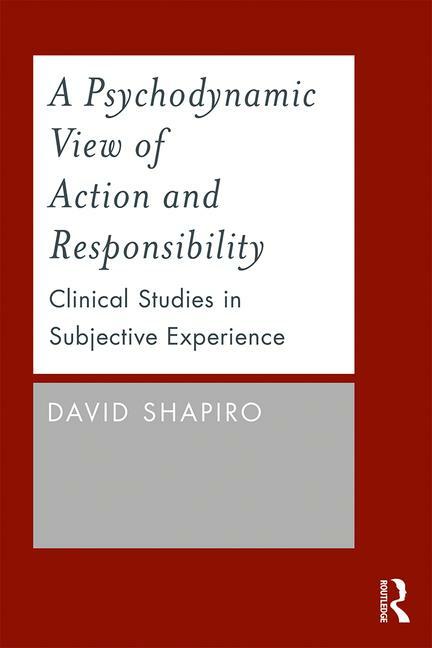 David Shapiro is Professor Emeritus at the Graduate Faculty, New School for Social Research in New York City and practices psychotherapy in New York. He previously practiced psychotherapy in Los Angeles and taught at the School of Social Welfare, UCLA. He is the author of Neurotic Styles, Autonomy and Rigid Character, Psychotherapy of Neurotic Character, and Dynamics of Character.